Every year consumers are being warned not to become victims of Christmas scams and to take extra care with personal and cyber security. And every year scammers take advantage of the buzz around holidays and find new and more creative ways to part them with their money, data, or both. If you are desperate to find the right product or help the needy, you are a perfect target for phishers, fly by night ecommerce merchants, and fraudulent charity workers. Find out more about the most common Christmas scams and fake Christmas deals not to get ripped off this holiday season. People tend to drop their guard during Christmas and the holidays in general. This makes them emotionally vulnerable and easily exploitable. According to a Time article, social media users should never lower their guard because the social media can be used for nefarious purposes, especially during the holidays. So, if you spend a lot of time on social networks, always stay alert for messages that include links; any links, even those shared by friends. Around this time of the year, there is always an increase in claims that promise free products, free gift cards, and free giveaways. Normally, to be able to get that free stuff, you need to click a link, which will redirect you to a page where you should fill out some details or answer a question that includes giving out personal information. At best, these websites will steal your personal data and either sell them to other companies (that will spam you in the future) or spam you themselves. The worst case scenario? They will install malware on your device (and we all know what that means) or get your credit card details. How to stay safe: By not clicking on any links you receive through the social media. Or, if the deal looks too enticing, make sure you run a few searches on Google to see whether that particular company is indeed throwing a Christmas giveaway. But, still, be cautious. This is one of the most common Christmas scams where scammers take advantage of people’s generosity and sensitivity towards those in need. It has been evidenced that people feel the need to help the fellow men more intense around this time of the year, and scammers know that. For that reason, they set up fake online charities. So, before you decide to make a donation to the first charity to steal your heart, always keep in mind that it may be a fake organization. Unfortunately, although it’s a sick practice, that does happen and scammers get away with thousands of dollars every year. How to stay safe: Don’t allow Christmas scams or anything else to push you away from helping the disadvantaged and needful fellow men. However, do check out charities before donating and only give money to reputable ones. And, before you click on a charity link, Google the charity organization, and then type in its address manually. It has been evidenced that one month before and one month after Christmas, shipping companies have the greatest package volume. A lot of consumers are eager to take advantage of fantastic Christmas deals. They rush to make all purchases much earlier. It means that there is a huge amount of products being shipped all around the globe; products that the people have ordered and need them delivered asap. To take advantage of that urgency, scammers send out fake shipping notification emails about an alleged shipping problem, asking for people’s personal information so that their “shipping/delivery issue” could be resolved. So, if you have indeed made an online purchase, and receive such an email, make sure you check out the sender and the purported product mentioned in the email. If nothing looks familiar to you, quickly toss the email to your junk folder. 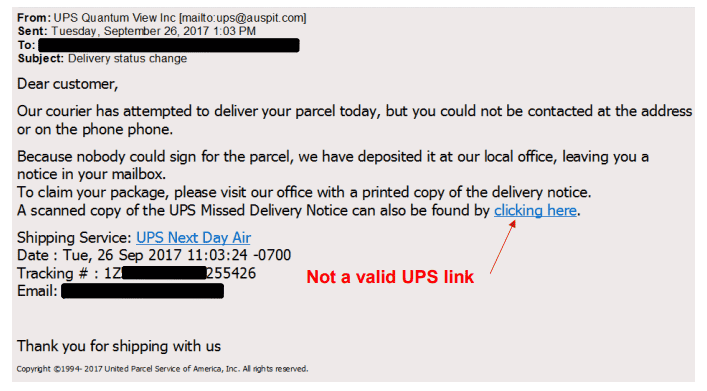 These fake shipping notification emails will include links that you should click (“Download an electronic copy of your delivery” in our example above). If you do, you will be asked to sign in to your eBay or Amazon account (or whatever other site) to resolve the problem. The idea is to steal your log in details and use it against you. This Christmas scam is also used to download viruses, spyware, or other unwanted software on to your computer or mobile device. Scam artists use malware to steal personal data, send spam, and commit fraud. How to stay safe: To protect yourself against such holiday scams, act with caution. For instance, if you receive an Amazon notification, open up a new tab in your browser and type in Amazon’s address. Do this because many scammers set up fake (look-alike) shopping websites (you can tell by checking the URL of the website you are being redirected to - it will contain the name of a well-known brand BUT will also contain extra words and/or small spelling mistakes). For example, you may click on a link included in your notification email and be redirected to a website that looks just like Amazon. If you enter your login credentials, the scammer(s) will steal your personal data. So, open up a new tab in your browser to log in to your account and check your messages/notifications. If something is problematic with the delivery or shipping of your package, it will be shown there. Do the same with any other website you receive a shipping notification email from. Sadly, this type of a Christmas scam also hurts the feelings of the receiver and can spoil their festive spirit. Fake e-card notification emails sending a virus and Trojan horses are becoming more and more difficult for a typical antivirus to detect. So, you may receive an email urging you to click on a link to view the e-card someone has sent you. If you recognize the sender’s name, then you are probably safe to read their Christmas wishes. However, take note that it could also be a scammer that has spoofed the name of a person you know. How to tell whether an e-card is fake or not? 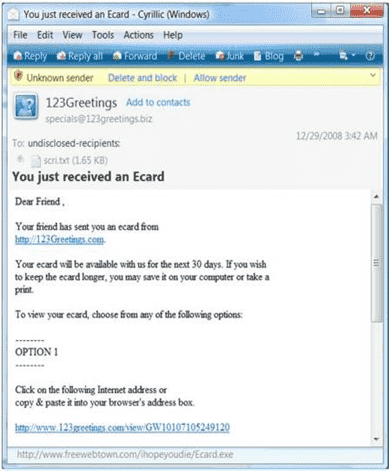 The e-card contains an attachment or a link with an “.exe” extension. “.exe” files are actually executable commands that can easily download a virus on your device if you allow them to run (by clicking on the corresponding link in the e-card). The sender is identified as a “secret admirer” or a “friend”. There is no confirmation code that allows you to open the e-card at the card company’s website. You need to share additional personal information to get the e-card. How to stay safe: Never opening e-cards sent from anonymous senders is an easy way to avoid this type of holiday scam. Instead, go to the card company’s website and open the card. For example, for American Greetings cards, visit their website and click on “e-card pickup”. You will then be asked to punch in the confirmation code you have received in your email. Although we are only humans and mistakes do happen, especially during a season of huge Christmas sales. 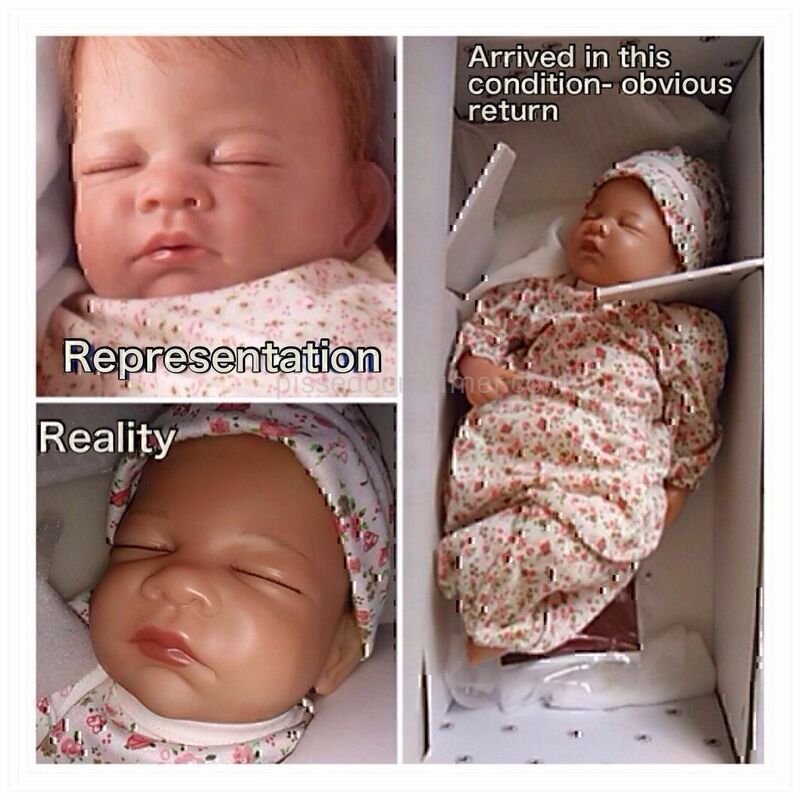 It appears that some companies have made it a habit to mislead customers into purchasing products that are either broken, of a lower quality or not the one(s) seen in the photos. As you will realize, such Christmas scams can ruin the holidays of small children that are eagerly looking forward to receiving their gift from Santa. December is the time when people focus more on their family, friends, gift giving and celebration. They look for Christmas sales to save some money, and can be easily tricked into Christmas scams. How to stay safe: Make sure you check out the Pissed Consumer database. There are thousands of reviews from consumers like you that have had a negative experience with a company. You will find information about what its customer service is like, whether a merchant delivers on time, and more. Just type in the name of the company or product you are about to purchase and see if you get any hits in our search base. Another way to protect yourself against holiday scams is to use the BBB Scam Tracker and see if there are any scams reported in or around your area. A holiday scam that aims at infecting your smartphone with malware (pretty much like hackers use malicious software to hack your computer). During the festive season, scammers spread out fake shopping ads on various app stores. To get the deals advertised, though, you need to type in your personal information (i.e. banking details). You see where this is going, right? How to stay safe: Only download trusted apps that have received lots of positive reviews. Also look at the negative reviews. What do people complain about (see image above)? It is also recommended for you to upgrade your antivirus frequently. Christmas deals usually look very enticing. 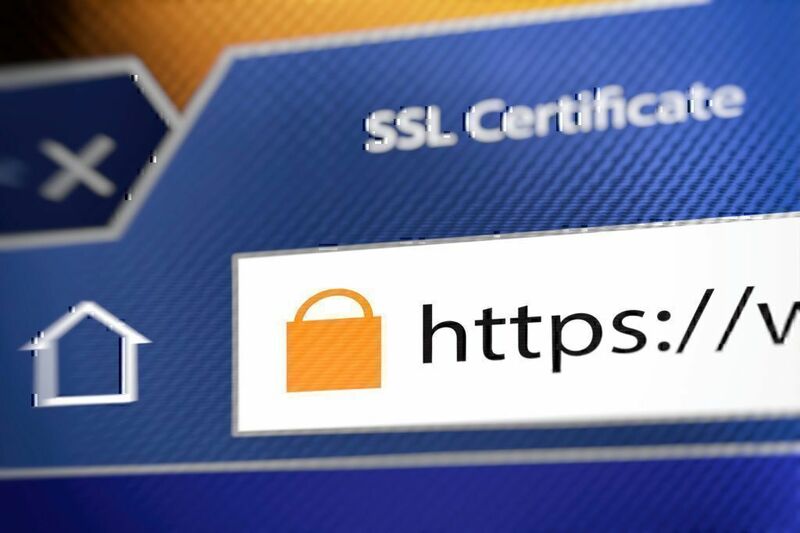 But, do not drop your guard and choose secure shopping websites with an HTTPS designation in front of the address are considered safe sites. Websites used to have the HTTP designation, but after the increasing cyberattacks, data breaches, and continuous hacking attempts, Google decided to take measures to protect users by informing website owners that they need to encrypt their transactions with their customers. This is how the HTTPS, where the “s” stands for secure, came into being. Only use ONE Credit CardUsing a prepaid card or a credit card with a low limit will allow you to do your online holiday shopping a tad easier and safer. Plus, it will simplify things for you as you will only have one account to monitor for an unusual activity. Also, it is recommended to avoid using a debit card for your online purchases. This is because in the event of a scam, the card issuer will have to fight to get its money while if a scam involves your debit card, you will be the one trying to get your money back. Do your HomeworkThere is a handy way to determine how long a website has been in existence and whether it was thrown up a couple of days ago to hit on seasonal shoppers. In the address bar, type “site:” and then the name of the company you want to check. For example, if you wanted to check out Pissed Consumer, you would need to type “site:pissedconsumer.com”. Once you hit enter, you will get all the pages that Google has indexed. If the company is old, you will get 100s or even 1000s of pages indexed. Click on the “search tools” > “Any Time” > “Custom Range” (“Any Time” scrolldown menu). You will be able to search a range of dates. Shop EarlyLeaving your holiday shopping to the last minute is always burdened with increased anxiety and, in some cases, desperation (last-minute shopping does not leave you with much choice/options so you will probably end up buying the first thing that pops out). This makes you rush things and not focus on identifying red flags and tell-tale signs of a Christmas scam. Makes sense considering all that pressure to find the perfect gift the soonest possible. To escape frustration, it is better to start shopping before the big rush. Do your research and take your time before you decide which proven business you will make a purchase from. If the company has a Facebook page (almost all companies do nowadays), visit it and read the reviews there too. Are there recent posts on that page? Do they update content regularly? Did they respond to a message you had sent them? A conscientious company will be quite active on their Facebook page. Your computer should always have up-to-date antivirus software. Send the company an email or call their customer service line to see if they will respond. Businesses that are not holiday-oriented will be able to stay afloat throughout the year. For bricks and mortar shopping, take note of anyone crowding your personal space when you are using your PIN number or a credit card at the register. They may be trying to steal your personal details. Also, make sure you always cover the screen (phone, Point of Sale terminal or other) when you punch in passwords or ID numbers. Remember that if something looks too good to be true, it probably is. In this case, just run in the opposite direction. Christmas scams will continue to raise concerns. However, there are ways to protect yourself and your loved ones from those that will try to trick you into revealing your personal details or making a disappointing purchase. 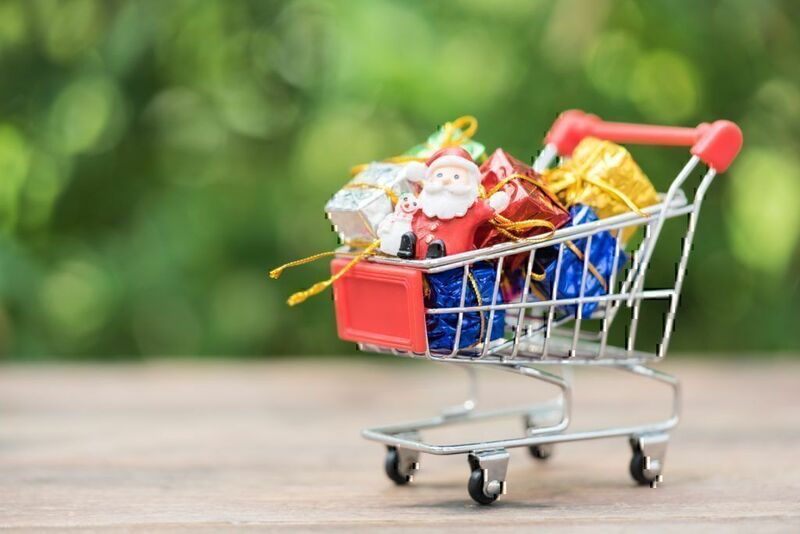 So, before you ramp up your spending this Christmas, ensure you look into whether the company you are about to purchase from is legitimate and follow the tips mentioned here to identify scammers asap.